Here is a Deep Dish Anatomy Chart in the style of a vintage hanging school chart. As you can see, Deep Dish Pizza is not built the same way as other pizzas. Yes, that is Latin on the bottom of the chart. Loosely (poorly?) 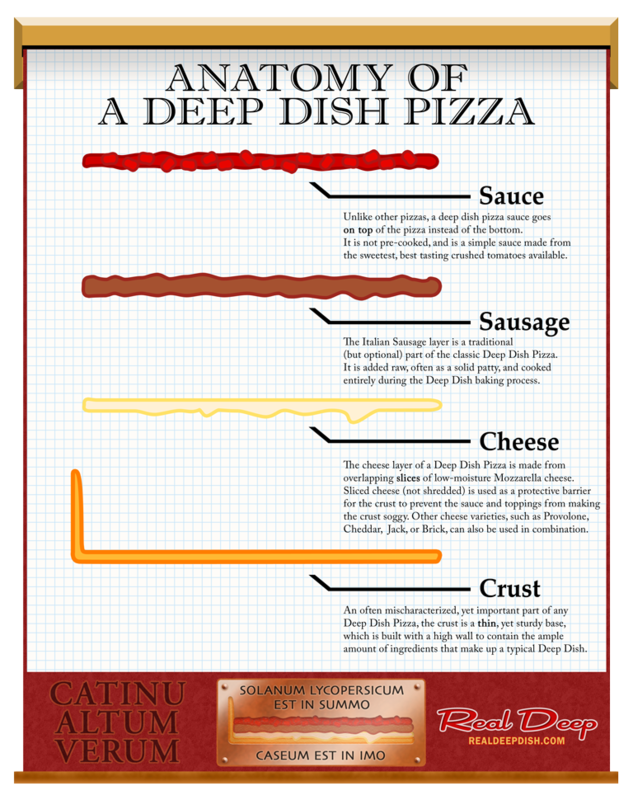 translated, Catinu Altum Verum means “Real Deep Dish” (duh! ); Solanum Lycopersicum is the latin name for the garden variety tomato. Caseum is latin for cheese. It’s an approximation of my deep dish motto: “Sauce on the Top, Cheese on the Bottom”. 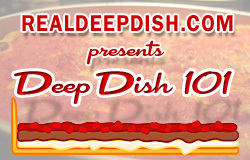 The easiest way to tell if a deep dish pizza is authentic is to see if the sauce is on top. 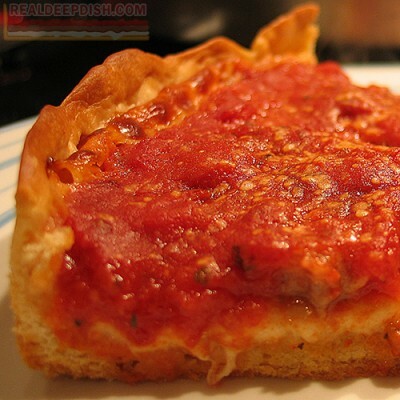 If you see a layer of cheese on top, you are not eating Chicago Style Deep Dish. Why is the sauce on top? Protection: The sauce is on top to prevent the cheese and other ingredients from burning during a 30-40 minute baking process. I have been trying few time to make a deep dish (or stuffed) with spinach, always a disaster. I have tried raw spinach, boiled ans squeezed, vape ans squeezed… Taste good but the bottom crust is always soggy, any advise? When I do spinach pizzas, I like to cook the spinach in a skillet with a little olive oil or butter, salt, pepper until they’ve totally wilted and most of the water is cooked out, and then add a little garlic at the end. Then, let the spinach cool before adding it to your pizza. For additional moisture control, you can try sprinkling some semolina on top of your dough after you press it out. It will absorb some of the water during baking. And go easy on the tomatoes. Let us know how your next pizza turns out. 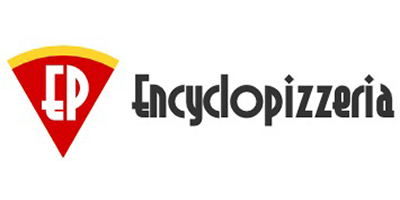 Thanks for visiting the website! Love love loved Marshalls, still craving it all these years later! I re- did my kitchen and ate there weekly for the entire time. Yum. Amen, Lisa! We likewise deeply miss Ed Marshall’s pizza. The crust had a sort of nutty flavor, and try as we might, we cannot duplicate it. Any ideas out there in deep dish pizza land? You could try asking about Marshall’s in the Chicago Pizza Forum on Pizzamaking.com. Someone reading that forum might have the answer. I worked at a pizza place that had it’s roots in the south side Roseland area. So I’ve been making pizza (thin crust) for 44 years or better. I always look for better recipes and ideas. I want to thank you for your recipes and techniques! I will say one thing different from all I’ve read here, don’t use a pizza stone get some 1/4″ steel that fits in your home oven, it works better! 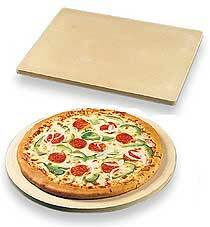 I hear good things about baking steel, especially for Chicago thin crust. Just digging in and Love the website. I made my first DDP last night; pretty good for the first time doing it. Did you ever try Marshall’s pizza in the past? This was a superior pizza out of Wheaton until the tax man shut them down. Big loss in my mind because I’m in Batavia and good pizza is hard to find. Sorry to say I’ve never had a pizza from the Wheaton area. Keep making the deep dish! Practice… tasty, tasty practice! Marshall’s was great. I miss that place. Ed Marshall’S Pizza was the best pizza I’ve ever had. I still get cravings for it! I was there from the very beginning when he was handing out free slices to bring in business. I worked at the local True Value Hardware store nearby and would go there to get lunch. My mouth is watering just thinking of it. Sadly, there is nothing I know of to take its place!